The testimonial letter below written by Sugar R, one of our current Pink Fund recipients who we funded for December, January and February, captures the fear, disbelief and sadness we see from applicants every day. 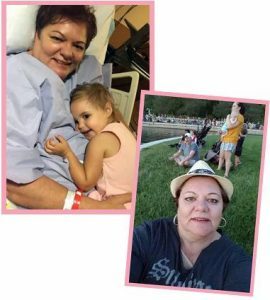 After a lifetime of giving to others through her work and charitable activity, Sugar is battling breast cancer for the second time, and living with the burden of financial toxicity where the overwhelming stress of the financial impact of cancer treatment, impairs a patient's well-being. I recently moved to Missouri to be closer to my beautiful daughter and my two new granddaughters. I am single and live on one income. I cannot work and Missouri doesn't have a State Disability Program. I have only 60% income, and have not been able to pay my rent. I have started selling off my personal items in an effort to pay my rent. I cannot pay my car payment or my electric. I have nothing. and I just cry when I remove my bandages. I must depend upon others for some food, and help. I cannot do anything physically, because I still have stitches, and I am exhausted. I am behind in my current rent. How would I move? I cannot even lift or pack a box. I have always been the person helping others, and NOW, I must learn to ask for help. family can take a moment to breathe. When you are diagnosed with Cancer it takes your breathe away. You hold your breathe thinking what will the surgery be like, what will the treatment be, how will we pay for this, who will help get food for me when I am too sick? How will I pay for the bills to keep my life "normal" and to have the simple necessities? For the first time since June our family can breathe! We can stop and breathe with ONE LESS WORRY.